Both river basins and watersheds are areas of land that drain to a particular water body, such as a lake, stream, river or estuary. In a river basin, some of the water drains to a large river. The term watershed is used to describe a smaller area of land that drains to a smaller stream, lake or wetland. There are many smaller watersheds within a river basin. Explanation: In a river basin, all the water drains to a large river (not some of the water). First and Third statements are self explanatory. A drainage pattern is described as discordant if it does not correlate to the topology. The difference between antecedent and superimposed river drainage is that whereas antecedent river drainage involves uplifting of river slope along with surrounding area, the superimposed drainage involves not changing the original slope. Both antecedent and superimposed river drainage are examples of concordant drainage pattern. Both antecedent and superimposed river drainage involves river sticking to their original slope. In case of antecedent river drainage, part of a river slope and the surrounding area gets uplifted and the river sticks to its original slope, cutting through the uplifted portion like a saw and forming deep gorges. In case of superimposed river drainage, a river flowing over a softer rock stratum reaches the harder basal rocks but continues to follow the initial slope, it seems to have no relation with the harder rock bed. Both antecedent and superimposed river drainage are examples of discordant drainage pattern. The Chambal, Sind, Ken, Betwa, Tons and Son meet the Yamuna and the Ganga at right angles. They are the subsequent drainage of the Ganga drainage system. Godavari, Krishna and Cauvery, descending from the Western Ghats and flowing into the Bay of Bengal, are some of the subsequent rivers of Peninsular India. Rivers like Godavari, Krishna and Cauvery, descending from the Western Ghats and flowing into the Bay of Bengal, are some of the consequent(not subsequent) rivers of Peninsular India. The rivers which follow the general direction of slope are known as the consequent rivers. Most of the rivers of peninsular India are consequent rivers. A tributary stream that is eroded along an underlying belt of non-resistant rock after the main drainage pattern (Consequent River) has been established is known as a subsequent river. The peninsular drainage is mainly Concordant except for few rivers in the upper peninsular region. The main water divide in peninsular rivers is formed by the Western Ghats, which run from north to south close to the western coast. The velocity of water in the rivers and the load carrying capacity of the streams is low due to high gradient. The west flowing rivers of Narmada and Tapi as well as those originating from the Western Ghats and falling in the Arabian Sea form estuaries in place of deltas. Mahanadi, the Godavari, the Krishna and the Tapi flow eastwards and drain into the Bay of Bengal. These rivers make deltas at their mouths. The velocity of water in the rivers and the load carrying capacity of the streams is low due to low (not high) gradient. Mahanadi, the Godavari, the Krishna flow eastwards(tapi flow westward) and drain into the Bay of Bengal. These rivers make deltas at their mouths.-tapi was written to check if student is reading the last options minutely or not. The velocity of water in the rivers and the load carrying capacity of the streams is low due to low gradient. Most of the major rivers of the peninsula such as the Mahanadi, the Godavari, the Krishna and the Cauvery flow eastwards and drain into the Bay of Bengal. These rivers make deltas at their mouths. But the west flowing rivers of Narmada and Tapi as well as those originating from the Western Ghats and falling in the Arabian Sea form estuaries in place of deltas. Indus River originates from Kailash range in Tibet near Lake Manasarovar and it flows between Ladakh and Pir Panjal ranges in Jammu and Kashmir before it passes on to Pakistan. Indus River is joined by Zaskar River near Indo-China border, Shyok River at Leh and near Skardu, it is joined by the Dhar river. Jhelum is the smallest and most western of the five rivers of Punjab and the Kishenganga (Neelum) River, is the largest tributary of the Jhelum. The Ravi which enters Punjab Plains (India) near Madhopur is the largest of Five Punjab Rivers with seul, baira, tant gari and buddhi as its tributaries. River Ravi is also called as the “River of Amritsar”. River Ujh is one of the most important tributaries of Ravi River which joins Ravi in Indian side of Punjab. The Ujh dam is a proposed hydroelectricity and irrigation multipurpose project in the pathankot district of Punjab over the Ravi River to help India utilize its share of water mandated under Indus water treaty. Only 1, 4 and 5. All the given statements are incorrect. Note: – Level of the question is extremely difficult. Kindly do not get disheartened if you didn’t have it right. UPSC has a tendency to throw in surprises related to river and its tributaries. The idea is NOT to frame extraordinary difficult questions to dishearten the candidates. The idea is to cover issue comprehensively so that bouncer thrown by UPSC can be tackled easily in exam hall. This issue of Indus water treaty is in news since past 4 years because of surgical strikes conducted in 2016 after the Uri attack and the recent Balakot air strikes. Many Newspapers carried reports on how India initiated 3 national level projects on Ravi River to utilize its 20% share of water mandated under Indus Water Treaty. This question is an attempt to link the current issue with static one and have better understanding of both. Indus River originates from Kailash range in Tibet near Lake Manasarovar and it flows between Ladakh and Zaskar ranges in Jammu and Kashmir before it pass on to Pakistan. Indus River is joined by Dhar River near Indo-China border, Zaskar River at Leh and near Skardu, it is joined by the Shyok river. Jhelum is the largest and most western of the five rivers of Punjab and the Kishenganga (Neelum) River, is the largest tributary of the Jhelum. The Ravi which enters Punjab Plains (india) near Madhopur is the smallest of Five Punjab Rivers with seul, baira, tant gari and buddhi as its tributaries. River Ravi is also called as the “River of lahore” since that city is on its eastern bank. River Ujh is one of the most important tributaries of Ravi River which joins Ravi at Nainkot in Pakistan. The Ujh dam is a proposed hydroelectricity and irrigation multipurpose project in Kathua district of Jammu over the Ravi River with a capacity to generate 196 MW of electricity. The main tributaries of the Ujh river are the Naaz and Bhinni Nallahs. It will help India utilize its share of water mandated under Indus water treaty. India has decided to fast-track three projects, including construction of two dams, to arrest the unutilised water of its share under the bilateral Indus Waters Treaty with Pakistan. The three projects include the Shahpur Kandi dam project, a second Sutlej-Beas link in Punjab and the Ujh Dam project in Jammu and Kashmir. All three have been declared national projects in 2009. Tributaries of the Ganga and the Yamuna such as the Chambal, the Betwa, the Ken, the Son and the Damodar flow in the north-westerly direction. The Mahanadi, the Godavari, the Krishna, the Cauvery and several smaller rivers drains south-east into the Bay of Bengal. Tributaries of the Ganga and the Yamuna such as the Chambal, the Betwa, the Ken, the Son and the Damodar flow in the north-easterly (not north westerly) direction. These rivers receive water both from the monsoons and melting snow hence they are seasonal in nature. These rivers flow across the young fold mountains and are still in a youthful stage. Himalayan rivers are highly tortuous and enter the plains with high water pressure. These are examples of antecedent drainage. The Himalayan Rivers are perennial in nature, i.e., water flows throughout the year in these rivers. These rivers receive water both from the monsoons and snow-melt. The perennial nature of these rivers makes them useful for irrigation. The upper reaches of the Himalayan Rivers are highly tortuous. When they enter the plains, there is a sudden reduction in the speed of flow of water. Under these circumstances these rivers form meanders and often shift their beds. PLEASE SEE THE LINK TO UNDERSTAND THE LOCATION OF RENUKA MULTIPURPOSE DAM PROJECT. 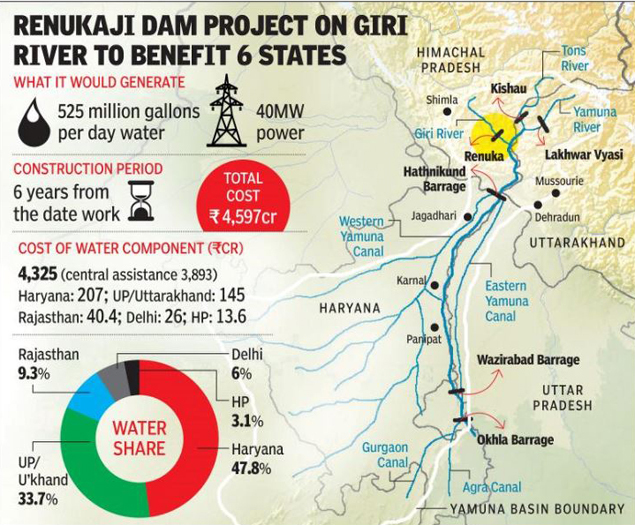 Giri river (a tributary of the Yamuna) is in news as recently Centre signed pact with 5 States [Uttar Pradesh, Rajasthan, Uttarakhand, Delhi, Himachal Pradesh] — to restart construction of the Renuka multipurpose dam project in the Upper Yamuna Basin. Jet streams have distinct peaks (ridges) and troughs. Ridges occur where the cold air mass pushes against the warm air mass. Troughs occur where warm air mass drops into cold air. The region on earth below the trough is at low pressure and the region below ridge is at high pressure. Usually the trough region creates cyclonic condition (high pressure) at the surface of earth whereas the ridge regions create anticyclonic condition. Explanation: Statement 2 and 4 are incorrect. Ridges occur where the warm air mass pushes against the cold air mass. Troughs occur where cold air mass drops into warm air. Usually the trough region [the region exactly below the jet stream trough] creates cyclonic condition (low pressure not high pressure) at the surface of earth whereas the ridge regions create anticyclonic condition. PLEASE SEE THE LINK TO UNDERSTAND THE POLAR VORTEX AND ITS RELATION WITH JET STREAM. Recently Tens of millions of Americans braved Arctic-like temperatures on January 31 as low as minus 49 degrees Celsius that paralysed the U.S. Midwest and were blamed for 21 deaths. Cause is said to be polar vortex phenomenon . Polar vortex refers to the upper level jet stream that circulates around both the North and South Poles, keeping the coldest air there. When that jet stream occasionally weakens and buckles, it disrupts weather patterns — bumping warmer air into Alaska and pushing cold winds down into the U.S. Midwest and East Coast. Sub-Tropical Jet stream plays a significant role in both hindering the monsoon winds as well as in quick onset of monsoons. The burst of monsoons depends upon the upper air circulation which is dominated by STJ. In winter STJ flows along the southern slopes of the Himalayas but in summer it shifts northwards. Northward movement of the subtropical jet is the first indication of the onset of the monsoon over India. Sub-Tropical Jet stream plays a significant role in both hindering the monsoon winds as well as in quick onset of monsoons. Sub-Tropical Jet stream is a narrow band of fast moving air flowing from west to east [Westerlies]. In winter STJ flows along the southern slopes of the Himalayas but in summer it shifts northwards, rather dramatically. The periodic movement of the Jet stream is often the indicator of the onset and subsequent withdrawal of the monsoon. Northward movement of the subtropical jet is the first indication of the onset of the monsoon over India.. There is no south west monsoon in winters because ITCZ has left India. During winter, the southern branch of Sub Tropical Jet stream is strong and is to the south of Himalayas. There is already a strong high pressure over Tibet. Which of the above statements contribute to no south-west monsoons during winter? Reason 1: ITCZ has left India (the winds that blow over India are mostly offshore –– land to land or land to ocean –– so they carry no moisture). The Sunderban delta is formed by Ganges river system and Brahmaputra river system only. The Barak River originates in Nagaland and it flows into Assam past the town of silchar and after that it gets divided into two parts of Surma River and Kushiyara River. River Brahmaputra is called as Yarlung Tsangpo in Tibet, Dihang in mountainous course and Siang in plain valley area of Arunachal Pradesh, Brahmaputra in Assam and Padma in Bangladesh. Brahmaputra is a classic example of a braided river and is highly susceptible to channel migration and avulsion. It is also one of the few rivers in the world that exhibit a tidal bore. Note: – Level of the question is very difficult. Chinese refused to share Brahmaputra river data with us after Doklam incident in 2017 and also China is building many dams on Brahmaputra River. Clashes in the Barak river valley and Brahmaputra valley due to citizenship amendment bill. This issue dominated headlines for most part of the year and we have no reasons as why not to include a question based on this in the geography section. PM of India has inaugurated many bridges in past 4-5 years over Brahmaputra. Frequent Floods in Brahmaputra River displacing lakhs of people every year during south west monsoons. Hence Candidates are advised to look into this aspect very carefully. It is not possible to cover all angles in one question but we have tried our best. Kindly do have a good look at this by referring the internet. FIRST OF ALL PLEASE SEE THE LINK FOR UNDERSTANDING THE LOCATION OF BARAK VALLEY AND BRAHMAPUTRA VALLEY. The Surma-Meghna River System is a river complex in the Indian Subcontinent, one of the three that form the Ganges Delta, the largest on earth. The other two are Ganges and Brahmaputra river system. The River rises in the Manipur Hills of northeast India as the Barak River and flows west becoming the Surma River and then flows south as the Meghna River. 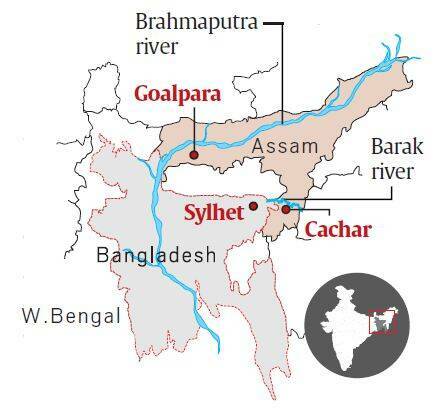 After entering into south Assam, Barak divides in two, with the northern branch being called the Surma River and the southern branch the Kushiyara River. At this point the river enters the Sylhet Depression (or trough) which forms the Surma Basin. The Surma is fed by tributaries from the Meghalaya Hills to the north, and is also known as the Baulai River after it is joined by the south-flowing Someswari River. The Kushiyara receives tributaries from the Sylhet Hills and Tripura Hills to the south, the principal one from the Tripura Hills being the Manu. The Kushiyara is also known as the Kai River after it is joined by a major offshoot (distributary) from the Surma. When the Surma and the Kushiyara finally rejoin in Kishoreganj District above Bhairab Bazar, the river is known as the Meghna River. River Brahmaputra is called as Yarlung Tsangpo in Tibet, Siang in mountainous course and Dihang in plain valley area of Arunachal Pradesh, Brahmaputra in Assam and Jamuna in Bangladesh. Brahmaputra flows southwest through the Assam Valley as Brahmaputra and south through Bangladesh as the Jamuna (not to be mistaken with Yamuna of India). In the vast Ganges Delta, it merges with the Padma, which is the popular name of the river Ganges in Bangladesh, and finally the Meghna (surma + kushiyara) and from here it is known as Meghna before emptying into the Bay of Bengal. PLEASE SEE THE LINK TO UNDERSTAND THE LOCATION OF CURRENT AND PROPOSED BRIDGES ON RIVER BRAHMAPUTRA. The Cabinet Committee on Economic Affairs approved the construction of a four-lane bridge over the Brahmaputra. It will be the country’s longest, and will boost connectivity and commerce in the region. At 19.28 km, it will connect Dhubri in Assam to Phulbari in Meghalaya. It is projected to reduce the travel distance between these two places from 205.3 km to 19.282 km, and travel time from 5 hours to 20 minutes. The current longest road and rail-road bridges of the country are already over the Brahmaputra. The Dhola-Sadiya bridge (road) runs 9.15 km, and the Bogibeel bridge (rail-road) is 4.94 km. The bridge will be built under the North-East Road Network Connectivity Project with loan assistance from Japan International Cooperation Agency. Which one of the following statements regarding the Monsoons is incorrect? The term monsoon has been derived from the Arabic word mausim meaning ‘season’. The monsoon is a double system of seasonal winds – They flow from sea to land during the summer and from land to sea during winter. America.South-west monsoons are formed due to intense low pressure system formed over the Tibetan plateau whereas the North-east monsoons are associated with high pressure cells over Tibetan and Siberian plateaus. Intense heating of Tibetan plateau during summer months. Permanent high pressure cell in the South Indian Ocean (east to north-east of Madagascar in summer). Tropical Easterly Jet (African Easterly Jet). Which of the above statements are the Factors responsible for south-west monsoon formation? Subtropical Jet Stream (STJ), Tropical Easterly Jet (African Easterly Jet) and Inter Tropical Convergence Zone are the Factors that influence the onset of south-west monsoons. They are not the Factors responsible for south-west monsoon formation. They just influence onset. The Intense heating of Tibetan plateau during summer months and the Permanent high pressure cell in the South Indian Ocean (east to north-east of Madagascar in summer) are the Factors that are not just responsible for south-west monsoon formation but they also influence onset of south west monsoon. In an El Nino year, air pressure drops over large areas of the central Pacific and along the coast of South America. Because of El Nino severe droughts occur in Australia, Indonesia, India and southern Africa. El Niño is the name given to the occasional development of warm ocean surface waters along the coast of Ecuador and Peru. When this warming occurs the usual upwelling of cold, nutrient rich deep ocean water is significantly reduced. In an El Niño year, air pressure drops over large areas of the central Pacific and along the coast of South America. The normal low pressure system is replaced by a weak high in the western Pacific (the southern oscillation). These changes in pressure pattern causes the trade winds to be reduced == Weak Walker Cell. Sometimes Walker Cell might even get reversed. This reduction allows the equatorial counter current (current along doldrums) to accumulate warm ocean water along the coastlines of Peru and Ecuador. This accumulation of warm water causes the thermocline to drop in the eastern part of Pacific Ocean which cuts off the upwelling of cold deep ocean water along the coast of Peru. Climatically, the development of an El Niño brings drought to the western Pacific, rains to the equatorial coast of South America, and convective storms and hurricanes to the central Pacific. Effects of El Nino includes the warmer waters had a devastating effect on marine life existing off the coast of Peru and Ecuador. Fish catches off the coast of South America were lower than in the normal year (Because there is no upwelling). Severe droughts occur in Australia, Indonesia, India and southern Africa and heavy rains in California, Ecuador, and the Gulf of Mexico. The formation of an El Niño [Circulation of Water] is linked with Pacific Ocean circulation pattern known as the southern oscillation. Southern Oscillation, in oceanography and climatology, is a coherent inter-annual fluctuation of atmospheric pressure over the tropical Indian Ocean region. Southern Oscillation, in oceanography and climatology, is a coherent inter-annual fluctuation of atmospheric pressure over the tropical Indo-Pacific (not Indian Ocean) region. El Nino and Southern Oscillation coincide most of the times hence their combination is called ENSO – El Nino Southern Oscillation. Only El Nino = [Warm water in Eastern Pacific + Cold water in Western Pacific]. ENSO = [Warm water in Eastern Pacific + Low Pressure over Eastern Pacific] + [Cold water in Western Pacific + High Pressure over Western Pacific]. The north-east trade winds cause which of the following in India? 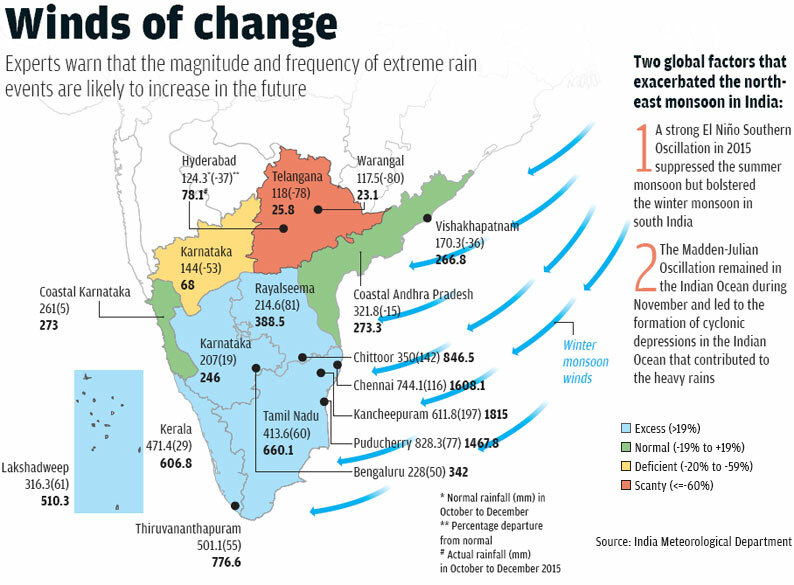 Explanation: Winter rains in Chennai are caused by north-east trade winds. While Southwest Monsoon covers entire country, Northeast Monsoon (NEM) affects only five sub-divisions of Tamil Nadu, Kerala, South Interior Karnataka, Rayalaseema and Coastal Andhra Pradesh. Unlike Southwest Monsoon, there is no official onset date for Northeast Monsoon (NEM) as well as the Monsoon sets in one go over the region. Rainfall variation is much more in Northeast Monsoon as compared to Southwest Monsoon. Usually intense cyclonic systems cause rainfall and improve the NEM’s performance, at least in the southern states, but that did not happen with the southern peninsula this time (end of 2018). The question contains 6 statements instead of the usual 4 because monsoon has been a complex issue and we wanted to complete much of it in as little space as possible. Also, the north east monsoon is usually given less importance by students as compared to the south west monsoon, so it is to be taken as a learning curve. In 2015, there was copious rainfall over Chennai which resulted in severe floods. One of the reasons was the extreme activity of the North East Monsoon. Please see the info graphic from DownToEarth for better understanding. The 2018 Kerala floods were due to excessive activity of both South West Monsoon and North East Monsoon. Kindly see the info graphic from times of India and note down the finer details for complete understanding of the issue. In January of 2019, it was reported that the south west monsoon last year was around 9% deficient but the north east monsoon in end of 2018 was deficient to the tune of 44% causing adverse effect on both winter sown rabi crop as well as the winter precipitation over Himalayas. Kindly see the link from DownToEarth given below. Its last paragraph also addresses the point 6 of the above question. Climate change has been a burning issue since past many years and this year is no exception with reports being circulated of setting up of a weak El-Nino this year. The following link is of February 2019 which indicates that El-Nino may affect Indian Monsoon this year. When we talk of Indian Monsoon both SW and NE are included. Since SW is covered in detail by routine questions the focus was on NE monsoon. The first five statements, all of them which are correct were taken from the following link of skymet. The concept of differential heating was primarily given to explain which of the following geographical phenomena in India? Explanation: The concept of differential heating about the origin of Indian Monsoon was given by Halley. All of the above flow into Arabian Sea. First the Goa government has given 6 month extension to casinos. Second, a new cable strayed bridge has been inaugurated on it. Thirdly, 50 year old dispute between Karnataka and Goa has been ended by the Mahadayi river water tribunal. Firstly, a boat ride service has been started at thane creek which is formed by Ulhass River. Secondly, a case is going on in the Supreme Court related to pollution of Ulhass River. Thirdly, Thane creek was declared as a flamingo sanctuary by the Maharashtra government in 2015. Fourthly, a museum on history of ulhass river basin has been inaugurated recently. The Mahadayi/Mandovi River also known as Mahadayi or Mhadei River is described as the lifeline of the Indian state of Goa. The Mandovi and the Zuari are the two primary rivers in the the Mormugao harbour. Panaji, the state capital and Old Goa, the former capital of Goa, are both situated on the left bank of the Mandovi. It originates from Bhimgad in the Western Ghats in the Belagavi district of Karnataka. With its cerulean waters, Dudhsagar Falls and Varapoha Falls, it is also known as the Gomati in a few places. Three large freshwater isles — Divar, Chorão and Vanxim are present in the Mandovi near the town of Old Goa. The island of Chorão is home to the Salim Ali Bird Sanctuary, named after the renowned ornithologist Salim Ali. A river that has its beginnings in pristine streams flowing down from the Western Ghats at Rajmachi near Lonavala, the Ulhas ends as a smelly creek in the Arabian Sea. The Ulhas begins its 122-km journey to Mumbai and the sea near Tungarli dam, where it is a fairly shallow water body. As it travels, it swells in volume and size with mountain streams feeding it. The river flows via Pune, Raigad and Thane districts, where the inhabitants of its banks use it for various purposes including washing clothes and fishing. The river flows through Khandala valley and interior Karjat. It then flows through Bhivpuri, Neral, Badlapur, Ambernath, Ulhasnagar, Shahad, Kalyan and Dombivli before joining the the Vasai creek and, eventually, reaching the Arabian Sea. The Maharashtra Government has declared the area along the western bank of the Thane Creek as the “Thane Creek Flamingo Sanctuary”. It will be Maharashtra’s second marine sanctuary after Malvan sanctuary. Which of the following statement is/are correct with respect to ‘Credit Rating Agencies’? It is an agency that collects and researches individual credit information and sells it for a fee to creditors so they can make a decision on granting loans. Credit Rating Agencies (CRA) assess creditworthiness of organisation and different entities. In simple words, these agencies analyse a debtor’s ability to repay the debt and also rate their credit risk. All the credit rating agencies in India are regulated by SEBI (Credit Rating Agencies) Regulations, 1999 of the Securities and Exchange Board of India Act, 1992. Other CRAs are Brickwork Ratings (BWR), Small and Medium Enterprises Rating Agency of India (SMERA), ICRA LIMITED etc. IPPB offers the facility of a Current Account to the small merchants/ kirana stores and individual businessmen. This account is a prerequisite for carrying out and expanding business. IPPB’s Current Account gets you started on the road to digital transactions for your business needs. Along with this, IPPB also offers a Merchant App for meeting business requirements. The current account can be opened at the Post Office Counters or at your doorstep through our Postman/GDS. E-VBAB Network Project is primarily a technological upgrade and extension of the Pan-African e-Network Project (Phase 1) which was implemented in 48 partner countries across Africa from 2009 till 2017. It seeks to prevent nuclear proliferation by controlling the export of materials, equipment and technology that can be used to manufacture nuclear weapons. North Korea and China are the only countries who are yet to sign the treaty. The Comprehensive Nuclear-Test-Ban Treaty (CTBT) is the Treaty banning all nuclear explosions – everywhere, by everyone. The Treaty was negotiated at the Conference on Disarmament in Geneva and adopted by the United Nations General Assembly. It opened for signature on 24 September 1996. Since then, the Treaty has reached near-universality. 182 countries have signed the Treaty – the last country to do so was Trinidad and Tobago on 8 October 2009 which also ratified the Treaty on 26 May 2010. 154 countries have ratified the Treaty – most recently Ghana on 14 June 2011. More than 60% of the RBI’s foreign reserves are held in the form of Gold. India is the largest holder of Gold reserve in the World. More than 60% of the RBI’s foreign reserves are held in the form of bonds and securities. The Reserve Bank of India, which added 6.5 tonnes of gold to its reserves in January 2019, taking its total holding forming part of its foreign exchange reserves to 607 tonnes, is set to become the tenth largest holder of the metal worldwide, displacing the Nerherlands. According to data provided by the World Gold Council, India’s share of gold held globally has been rising steadily to stand at 6.2 per cent at the end of 2018 and has gone up further in January 2019. Mycotoxins are manmade toxins produced by certain moulds (fungi) and are found in artificially made food. Mycotoxins can cause a variety of adverse health effects and pose a serious health threat to both humans and livestock. Aflatoxins are amongst the most poisonous mycotoxins and are produced by certain moulds which grow in soil, decaying vegetation, hay, and grains. Mycotoxins are naturally occurring toxins produced by certain moulds (fungi) and can be found in food. The adverse health effects of mycotoxins range from acute poisoning to long-term effects such as immune deficiency and cancer. Ochratoxin A is produced by several species of Aspergillus and Penicillium and is a common food-contaminating mycotoxin. Contamination of food commodities, such as cereals and cereal products, coffee beans, dry vine fruits, wine and grape juice, spices and liquorice, occurs worldwide. Ochratoxin A is formed during the storage of crops and is known to cause a number of toxic effects in animal species. Patulin is a mycotoxin produced by a variety of moulds, particularly Aspergillus, Penicillium and Byssochlamys. Often found in rotting apples and apple products, patulin can also occur in various mouldy fruits, grains and other foods. Major human dietary sources of patulin are apples and apple juice made from affected fruit. India is the largest producers of edible oil in the World. Edible-oil accounts for one of the largest agricultural commodity being exported by India. Both the statements are wrong. Among food commodities, edible oil import is the largest with a foreign exchange outgo of a humongous $11 Billion (₹77,000 crore) towards import of about 15 million tonnes of various types of oils. Imports are necessary because consumption continues to far outstrip domestic production. The central government has prepared a five-year schedule to double India’s edible oil production and reduce import dependence, through expansion in sowing area and yield. India is the second largest producer of sugar in the world. India is the largest consumer of sugar in the world. India, which is the world’s largest consumer of sugar, is set to produce a record yield of sugarcane in the current financial year. This is largely because sugarcane farmers are assured of a government-mandated fair price from sugar mills that exceeds their costs by a significant margin. According to data from the Indian Sugar Mills Association, the country’s sugarcane farmers will produce 35.5 million tonnes of sugar between October 2018, when the crop season starts, and September 2019. This is a significant jump over the 32.2 million tonnes it will have produced by the end of 2017-18. In doing so, India will unseat Brazil as the world’s largest producer of sugar. Currently, Brazil is the largest producer of sugar in the world. Both Ethiopia and Eritrea are landlocked countries. 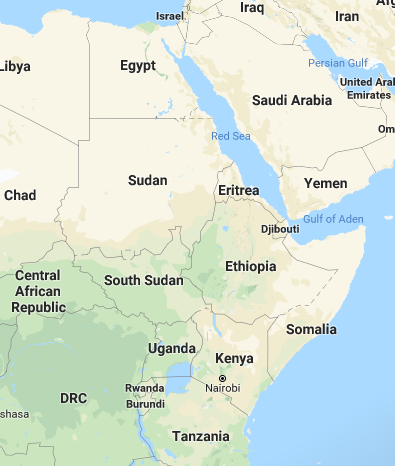 Both share border with Djibouti.